When I had my first son, I had all sorts of ideas and opinions on how my pregnancy and his upbringing would go. I’d done my research. I’d purchased a plethora of childcare books, the ones guaranteeing a healthy pregnancy, others focusing on that pivotal first year, and even a few guiding me on how to ensure a happy, healthy baby through toddlerhood and beyond. I’m a habitual planner. I feel calm when I can be the one in control of my own destiny. I figured childcare would fall easily in line with all the notions I’d read, all the guides and outlines, calendars and note keeping. Everything would go according to plan. My son was an awesome baby, an easy baby, for the most part, but I often felt lost in translation. He didn’t do anything the books told me he’d do within a certain time frame. A friend purchased a sleep training guide in an effort to help me get him on some sort of sleep schedule, which didn’t work. Still others told me to “do this”, or “don’t do that”. I didn’t have as much of a support system as I would have liked to have, in those days. Friends were at work when I’d needed help or had questions. My husband at the time had been stationed overseas for nearly five long months. I didn’t have family to confide in. I felt alone in a lot of ways. I wish I’d had a book like this one. 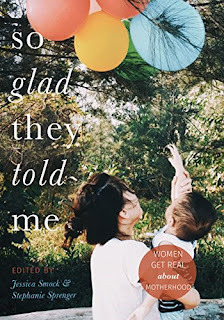 So Glad They Told Me: Women Get Real About Motherhood gives personal insights into what it’s really like to be a mom. The joys. The sorrows. The contributors give their own anecdotal experiences, which are far from perfect, but that’s what makes it so wonderfully real. There are plenty of stories I can relate to and identify with, from that first year to what it’s like dealing with tweens and teenagers, and beyond. It’s going to continue being relevant for me, because being a parent will be something I am for the rest of my life. There are stories relating to what it’s like when your children move on and continue forth with their own adult lives, something I know will be a hard situation for me when that time comes. What I appreciate most about So Glad They Told Me, is that the writers aren’t telling the readers to “do this”, or “don’t do that”. They merely share their own experiences in the hopes of reaching out to other mothers who might be dealing with a similar situation. It’s a must-have for anyone who’s a mother, a parent, or for those who are looking for an inspirational read. By the time my second son was born, I felt as though I had a better grip on things, yet my little boy threw me a curve-ball. He wasn’t at all like his older brother. Not to say he wasn’t as awesome, he just wasn’t as easy. There have been quite a few moments during motherhood where I’ve questioned myself, if I’m doing the right thing. 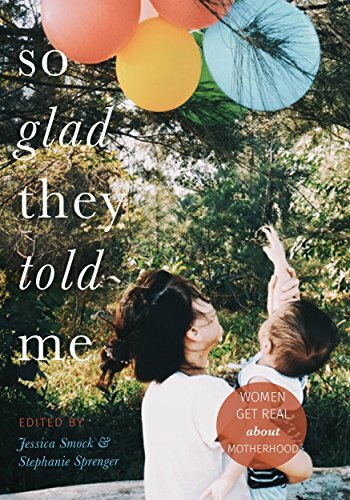 By reading stories from other mothers, like the ones found in So Glad They Told Me, I don’t feel alone in that sentiment. Even if at times we feel like failures in the parent department, our children will turn out alright. Thanks to The HerStories Project Press for the book in exchange for an honest review. I can't really relate to any motherhood stories, but this sounds like a good book for anyone thinking of having a child. This book is PHENOMENAL. The range of stories is diverse, the advice is varied, and — as a toddler mom — there are pieces I can relate to, and pieces I hope I will learn from.